The official date for International Men's Day was 19th November this year but we're celebrating a little later than usual. 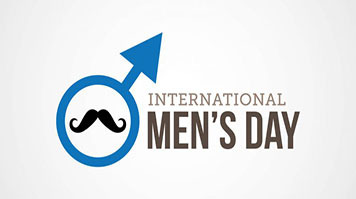 International Men's Day is a day that includes everyone and is a time to reflect on issues that affects men around the world... be it yourself or your brother, your dad or partner or your son, uncle or nephew, or even a colleague. There's many reasons why you should attend! 12pm - 2pm There will be a range of exhibition stands relating to men's health and other issues on the London Road Concourse including MIND and Survivors UK as well as LSBU's own wellbeing team and the Confucius Institute providing massages (slots to be booked on the day). Feel free to drop by! 3pm - 4pm "Yes And...." accepting ideas and building on them. A series of exercises/games teaching the value of accepting each other’s ideas and cooperating with one another. The concept ‘Yes And’ is to agree with everything you are told and then to expand on it. This workshop should push individuals beyond their comfort zone helping them to think on their feet and not having their ideas blocked by negative comments from those who would disagree... in other words, always empowering your ideas. The session will also cover listening and passing on information. Jonathan has worked in London’s legal and financial services industries for the past 25 years. Alongside his senior leadership role, Jonathan is also an executive coach. He gained an insight into the obstacles people face when they have mental wellness challenges after he experienced the trauma of child bereavement. coaching to help people learn how to have Mentally Healthy Conversations. In this talk, Jonathan will invite you to play the role of his boss, a tutor, teacher, friend or colleague. In that role you’ll learn from Jonathan’s experience, and from how mental health has been portrayed in film. And from this, you’ll start to rebuild the conversation. You’ll discover a totally different way in which you can have a successful conversation about mental health. The Academy of Sport will also be hosting some activities as part of International Men's Day - check out the latest Universe for more info!